The Blue Spruce is a relaxing getaway for every season. Get above the heat and away from the crowds during the summer. Refresh yourself with the peace and tranquility of the unique fall, winter, and spring seasons at a secluded resort nestled among the pines at the end of a high mountain lake valley. Nature envelopes this place. By leaving your own back door you'll enjoy miles of wilderness trails teeming with wildlife. Whatever activity you enjoy, the Vallecito Lake and Durango area has it all. Use our location as your base camp for fishing, hiking, biking, hunting, marinas, horseback riding, whitewater rafting, kayaking, climbing, monument touring, off-roading, the famous Durango-Silverton Narrow Gauge Railroad, snowshoeing, groomed Nordic ski trails, and snowmobiling. Be Interactive! Click and Hold your mouse on the 360 Tours to view the tree tops! Please click "SHOW DETAILS" ---------------------------------------------> to view captions of pictures describing Cabins, Lofts, Amenities, Event Center, and more! Allow Blue Spruce to help you host your next big event, we are able to accommodate numbers from dozens to hundreds, both indoors & out. Our pavilion is located in the back corner of the park, next to a fountain built into the rock wall, steps away from entry to the National Forest. At an impressive 30 by 40 feet, it is a beautifully crafted, open-air log structure with a cathedral ceiling & finished concrete floor, perfect for a newlywed's first dance or a yoga retreat. Lights, tables, chairs, an ambiance-setting fire pit & close access to outdoor grills make this the perfect gathering place. The Events Lodge at Blue Spruce is a 22 by 70-foot, enclosed log building with a cathedral ceiling, fireplace, porch, & full cooking facilities. We are capable of providing banquet tables, chairs, food warmers, & more to make your wedding, family reunion, corporate retreat or workshop the most enjoyable event of your year. 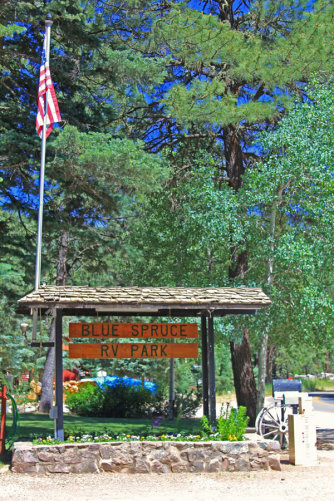 Cabins, Loft Apartments, and Event facilities at Blue Spruce are available all year-round. Perhaps your visit will fall during one of our spectacular Indian Summers, where autumn colors abound; brilliant yellows, oranges & reds provide both professional photographers & laymen with shots that will delight the eyes for years to come. The long shadows of the spruce & pine trees add an aura of mystique to nature hikes during this time, much like walking off into a sunset. Approaching winter, your time spent here might reward you with the delightful timing of the first snow, which you can enjoy from the warmth of a cozy cabin, or on one of the many backcountry trails on skis or snowshoes. Due to our elevation, the RV sites are closed from November 1st to May 1st. Please feel free to call anytime, whether it's to book reservations or ask questions about the area. Like Blue Spruce on Facebook, Thanks!!! 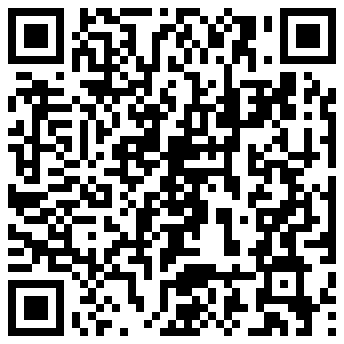 The Blue Spruce Has Its Own QR Code! Vallecito Sporting & Conservation Assoc.